I enjoy attending Winemaker hosted dinners. 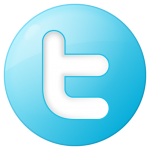 If possible, I will always sit next to him or she and I like to pick their brain. Some of the questions I like to ask is. Why do they make this varietal? What was the reason they wanted to be a winemaker, etc? For me, winemaking is a passion. Every vintage and wine you make will have its own story. Did the wine turn out the way you expected? Was it a problem child or everything just worked. We had the opportunity to meet Shane Finley during a recent wine dinner at a T-Box in Ham Lake. It was a small event around 20 people. During each course, a new wine was introduced and Shane would briefly talk about it. That night we tried five wines. All were exceptional. We also learned Shane was raised in Minnesota. Minnesota has produced many great winemakers including the Mondavi Family. Pale color depth and a pink hue. Moderate, young-fruity with aromas of raspberry, red cherry. Dry, light-bodied with bright acidity. Crisp flavors with a long savory finish. Since the night of the wine dinner, we have reached out to Shane. 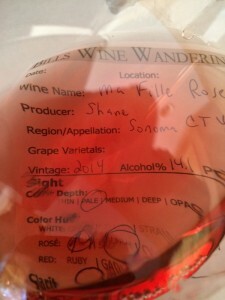 We have a scheduled tasting and are looking forward to spending some time with Shane. 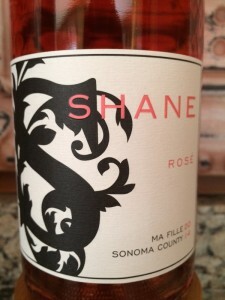 I rated the 2014 Shane Wine Cellars Ma Fille Rose four glasses. Shane’s Rose is one of my favorites.